(Lake Balboa, CA.) May 23, 2011 – VANNA K, leading designer of bridal and fashion jewelry, recently launched a Facebook contest, The Diamond Ring Sweepstakes, where two lucky winners will be selected to win either a semi-mount engagement ring or a matching wedding band with a combined worth of $10,000. 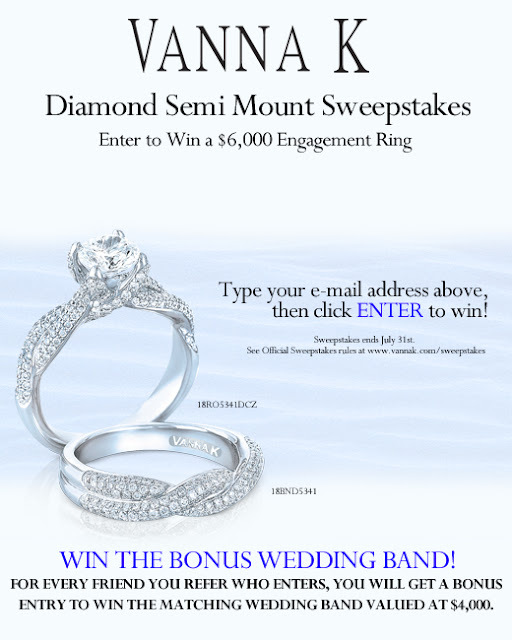 Fans of the brand can log onto Vanna K’s Facebook page and enter to win a semi-mount engagement ring worth $6,000. In addition, for every friend each fan refers to enter the sweepstakes, they will also receive a bonus entry for the matching wedding band worth $4,000. “Facebook has become such an important way for us to communicate directly with our fan base,” said Vanna. “We are fortunate to have such a loyal following and we wanted to reward our fans with the opportunity to win one of our best selling engagement or wedding ring sets just in time for wedding season”. Two participants of the sweepstakes will each win one ring from the Solea collection. The grand prize participant will win a semi-mount engagement ring made of 18 Karat white gold set with approximately 192 diamonds with an approximate total carat weight of 0.74. The bonus ring will be awarded to the second winner. This ring is the matching wedding band and is made of 18 Karat white gold set with approximately 148 diamonds with an approximate total carat weight of 0.65. The contest runs until July 31st, 2011. Visit http://www.facebook.com/VannaKJewelry to enter today. VANNA K Bridal & Fashion jewelry brings a fresh sense of style to a new generation. The brand designs with an aura of energy that interacts with the mind and body and resonates with her admirer.